Imagine your seventeen-year-old son comes to you and tell you that his pregnant 19-year-old ex-girlfriend and her 17-year-old brother have been murdered. He tells you that there has not been an arrest for their murders. Then he tells you that he may have some information that may help detectives with their investigation. Next, he tells you that he has a feeling that the police are following him. You then discuss the information that he has to tell detectives and why he believes the police are following him. As a responsible parent, you take your seventeen-year-old son, who has no violent criminal history, to the local sheriff’s office (in this case the Leon County Sheriff’s Office in Tallahassee, FL) to speak with law enforcement officers about the murders. As a parent, you are well aware of your parental rights. However, you never anticipate that you’ll find yourself in the presence of a racist cocky detective, who crumbles up your parental rights and tosses them into the trash can—like what you say means nothing. (Yes, right there in front of your son.) And then, when you tell detectives that you want an attorney for your son, they completely ignore you—leaving you standing in the lobby in total disbelief. Disbelief that the rights that your ancestors and so many Black people died for has been completely demolished right before your eyes. And for what? If you were a grizzly bear—you would’ve swatted their heads off their bodies—isn’t that what grizzly bears do when they feel like their cubs are in danger? Now you know with detectives totally disrespecting you as a parent, then they can only have ill will for your son. Soon enough, detectives charge your 17-year-old son with Cultivation of Marijuana, Possession of Drug Paraphernalia, Two Counts of 1st Degree Murder, and Possession of a Firearm by a Juvenile Delinquent. Your son then sits in jail for over 30 days without a court appointed attorney. Acting on a referral, you hire a local private attorney. When you learn that the State Prosecutor assigned to your son’s case is the son of the local Sheriff (who has jurisdiction over the murder investigation), you know that you have to watch the case very close. You learn that the 1st lead detective just about concluded that there wasn’t enough probable cause to charge your son with the murders. Then you learn that it was the racist detective that you first encountered (who turns out to be a possible reserve deputy) replaces the 1st lead detective. You see where there’s a possibility that this 2nd lead detective forges legal documents that led to your son being charged and arrested. Before you can digest that information, you find out that this 2nd lead detective’s wife is the vice president of a popular bank—they’re longtime family friends of the sheriff’s. Over the next sixteen months, your son’s private attorney is not passing the numerous “Smell Tests” that you’re placing in front of him. There are certain things that the State Prosecutor is doing/ not doing that just cannot be considered coincidental. Your son’s trial date has been rescheduled four times. Meanwhile, your son’s private attorney never discussing his plan of defense with you or your son; he never deposes the one witness that detectives claimed to have given an incriminating statement about your son; he never discusses the victims’ time of death or their autopsy reports and he never UnSeal’s your son’s cell phone records—all of these key things that will completely exonerate your son. After investing $29560 in your son’s private attorney, you and your son decide to fire him. Simultaneous to firing your son’s private attorney, you receive a jailhouse phone call from your son. He tells you that he’s being charged with Solicitation to Commit Murder. He tells you that law enforcement officers are saying that he put a hit out on the one witness that supposedly gave an incriminating statement against him. As you’re on the phone with your son, the phone call abruptly disconnects. When you go to the jailhouse to visit with your son, you learn that he’s in solitary confinement, where he cannot have visitors and he cannot make phone calls. You cannot immediately afford an attorney, so you write to your son and you tell him to go with a court appointed attorney until you can get your finances in order. Four court appointed attorneys later—two and a half years later, your son—who’s now 19-years-old, remains in the county jail without a sworn incriminating statement against him; without any physical, material, or circumstantial evidence against him. The State Prosecutor is refusing to allow the Medical Examiner’s Office to release the victims’ autopsy reports into public record. Both you and your son remain in the dark about the victims’ time of death. Your son’s current court appointed attorney refuses to file the necessary court documents to have the victims’ autopsy reports made public record, as well as seek the disclosure of other vital information that can help immediately exonerate your son. You’ve already filed a complaint against your son’s former private attorney with The Florida Bar—who is an official arm of the Supreme Court, charged with administering a statewide disciplinary system to enforce Supreme Court professional rules of conduct—however, their response is that they didn’t find where the attorney violated any of the rules of professional conduct. You begin to think that maybe The Florida Bar is treating you like a stepchild because you’re not the actual client. You encourage your son to file a complaint with The Florida Bar—his complaint is mostly ignored. Now you, as a parent, start to feel hopeless about the county judicial system. You don’t have another lump sum of money to invest in another attorney—especially when The Florida Bar turns a blind-eye to a lawyer’s obvious unethical behavior. The Florida Ethics Commission says that there’s no existence of “natural bias” where the State Prosecutor is the son of the Sheriff. Regardless as to how obvious it is that the State Prosecutor is trying to cover up the mess made by his dad’s detectives for failing to properly investigate the double murder case—and then hastily arresting your son. You ask yourself, “Where do you go? What do you do?” You begin to feel frustrated! Your son has been in solitary confinement now for almost 300 days. The only time you get to see him is when he has a court date. You haven’t talked to him since… Now, as a God fearing parent, you have to reach deep down into your soul and revitalize your Spirit, after all that’s why God filled you with it! You decide to write to the governor (again). You can’t write to the judge because the judge is not passing the “Smell Test” either. In your letter to the governor, you tell him all that you’ve told him before—but this time you tell him that you feel as if the judge presiding over your son’s case is not protecting your son’s Constitutional Rights. A month later, at your son’s next court date, unbeknowest to you, there’s a new judge assigned to your son’s case. In addition to the new judge on his case, for the first time in 2 ½ years there’s been legal documents filed to show that your son has a legal defense. You check your son’s case file and you see that there was a Defendant’s Witness List and three Motions in Limine filed on his behalf. One of the Motions in Limine filed (Motion in Limine (Someone Else Committed the Offense)) is in regards to the same information that your son had planned to tell detectives 2 ½ years earlier. It’s information that your son’s previous attorneys were aware of from the start. Information that you learned the victims’ mother and other family members had told detectives just a few hours after the victims’ bodies had been found in the family’s townhouse. The information: Within 48 hours of the victims being found murdered, the best friend of the female victim had posted on Facebook that she had a hit out on her (the female victim). The two young women had been doing a lot of arguing back and forth because the female victim owed the best friend and her best friend’s mother money for rent. A month earlier, the female victim had moved in with her best friend and her best friend’s mother—the living arrangements didn’t work out. The female victim moved out and refused to pay the rent owed. (The female victim had only been back in her mother’s townhouse a couple of days before the murders.) Within 48 hours of the victims’ bodies being found, the female victim, along with other friends and family members, went over to the now ex-best friend’s house to fight over the numerous threats that had been exchanged over Facebook. Within 48 hours of the victims’ bodies being found, as they were all packed into a car headed to fight her once best friend, the female victim warned her family members and friends not to go up to the girl’s house because her mama has a gun. According to detectives reports, on January 27, 2011 as detectives were still processing the crime scene, the once best friend—the young woman who’d recently had a highly charged confrontation with the female victim, showed up at the crime scene distraught. Detectives suggested that she go to the sheriff’s office and give a statement. (The location of the crime scene, the sheriff’s office and the best friend’s residence are all located within about a five mile radius.) At the sheriff’s office, the young woman did not deny making the threats or any of the other issues surrounding the facts that there were clearly issues between the three of them (her, her mother and the female victim) over money. Despite having a number of witnesses who’d read the back and forth threats between the female victim and the best friend (including your son), detectives allowed the ex-best friend to retain her cell phone and leave the sheriff’s office. When detectives learned that there may have been at least 15 people total involved in the confrontation between the best friend and the female victim, instead of detectives seeking the best friend’s mother’s gun, using fabricated information, they obtain a court order for your son’s cell phone records and to have your son GPS tracked by his cell phone via his cell phone carrier. When your son’s cell phone records don’t give weight to detectives’ theory (whatever it may be), they obtain another court order to have your son’s cell phone records Sealed. And when detectives locate your son—they don’t approach him right away. They watch him get into the backseat of a vehicle with a young child and another male; getting in the front seat was a female and a male. Detectives follow the vehicle and then initiate a traffic stop. During the traffic stop they make everyone get out of the vehicle. They ask your son if he wants to come to the sheriff’s office to give a statement—when your son tells them no—they take photos of your son’s shoes and allows him to go on with the other occupants with exception of one. (One of the males had an outstanding warrant for non-payment of child support.) All of these events occur on the same day the victims’ bodies were found. Unfortunately, for sheriff’s detectives, the two young victims were both in debt to others for more than $300. The sixteen-year-old brother tells detectives that his brother (male victim) had been given $400 in fake money by an adult male to purchase drugs. The plan the adult male had was for them to resell the drugs and split the money. Within a few hours after finding the victims, their mother and other family members tells detectives that their residence had been recently burglarized—more than once. The mother tells detectives that her son (male victim) identified the burglar as his 16-year-old male friend. The mother tells detectives that her son (male victim) told her that while he was asleep, the 16-year-old male friend some kind of way entered into their residence. When he awoke, the friend was standing over him. Detectives are told that the male friend and the male victim had also recently gotten into a physical fight. The victims’ mother provides detectives with the contact name and number for the 16-year-old male’s mother. Apparently, detectives never make contact with the male friend’s mother. A few months after the murders, the male friend (who’d turned 17-years-old) was arrested for assaulting someone with a gun. Despite this 17-year-old male’s extensive juvenile record, his assault with a gun charge is left in the juvenile court division—where the details about the assault—including what type of gun was used are confidential. Now with a new judge on your son’s case, your curiosity level peaks—you need to know what, if anything, did the judge actually do or did not do—other than allow the sheriff’s son (state prosecutor) and your son’s former private attorney to allow shenanigans to go on in his courtroom. You immediately learn that you were right! The judge did fail to protect your son’s Constitutional Rights. You learn that not only did the judge fail to protect your son’s Constitutional Rights, but the judge actively participated in violating your son’s Constitutional Rights. After thanking God for giving you the wisdom to see all of discrepancies in your son’s case—now what do you do? You still don’t trust criminal defense attorneys. You have spoken directly to the Federal Bureau of Investigations and the Florida Department of Law Enforcement about your concerns of corruption involving those in authority. However, the FBI and the FDLE tells you that they can’t get involved until the legal case against your son is over. No, it’s not your son–it’s my son. There’s a motion filed showing where someone else likely committed the murders, but the judge has scheduled to take up that motion almost two months out (mid-August 2013). Meanwhile, my son’s 20th birthday is coming up—it’ll be his 3rd birthday for him to have spent in jail. Because there’s no widespread community outpour—my news media contacts are falling flat. I know that I have a story to tell—but seemingly no one wants to be the first to break the news. “Injustice anywhere, is a threat to justice everywhere.” —MLK Jr.
It’s been over 2 1/2 years since Leon County Sheriff’s Detectives were called to a townhouse in NW Tallahassee, Florida regarding a double homicide. On the morning of January 27, 2011 the bodies of pregnant 20-year-old single mother, Laqecia Herring & her 17-year-old brother, Sterling Conner Jr. who was diagnosed as bipolar were found by their mother, 16-year-old brother & their mother’s girlfriend (significant other). Despite the victims’ family members providing Det. with a laundry list of possible suspects (their residence was recently burglarized; both victims was in debited to others of $350 to $400; the male victim recently purchased drugs w/fake money) LCSO Det. chose to ignore those leads and create their own theory. Their theory–focus on a 17-year-old black male child by the name of DeShon Thomas. DeShon was in his freshman year at Tallahassee Community College & working over 35 hours a week part-time at a fast-food restaurant. DeShon & Laqecia had dated for about 6 to 8 weeks. In late Sept. 2010 (shortly after DeShon’s 17th Bday) DeShon & his mother got into an argument; DeShon moved in w/Laqecia. DeShon & Laqecia had only been dating for 2 weeks. When DeShon’s mother found out that he was living with Laqecia, she drove to Laqecia’s residence to force him to come home. When he wouldn’t come on his own, she called LCSO, a deputy arrived. To DeShon’s mother’s disappointment, the deputy thought the situation was comical. Instead of coming as a mature adult LEO, he came as a high school-boyish LEO. He seemed to think that it was cute for a 17yo boy to be with a 19yo young woman, who was already the mother of a toddler. The deputy told DeShon’s mother that there was nothing that he could do since DeShon was over the age of 16. In less than 6 weeks, DeShon was back home. Like most teenage boys—it didn’t take long for the flame to go out. However, Laqecia told DeShon that she was pregnant & he was the father. (After the murders, DeShon’s mother learned that the residence was not Laqecia’s residence—it was her mother’s residence. Learning this was very disappointing to DeShon’s mother; thinking back she could’ve spoken with Laqecia’s mother and possibly prevented her son from moving in). We would all love to trust LEO. Sadly, we cannot. DeShon Thomas is now 19-years-old. When LCSO Det. realized that there was just no way they could win a double murder trial against DeShon, they put a 30-year-old male inmate, who had been charged w/bank robbery, in his path & concocted a way to charge DeShon w/solicitation to commit murder. This charge came simultaneous to DeShon’s mother firing his private attorney, Greg Cummings, who seemed to be just too cozy with State Prosecutor, Jack Campbell—who by the way is the son of Leon County Sheriff Larry Campbell. The Campbell’s—the father & son duo—are both fully in charge of the investigation & the prosecution of DeShon. DeShon’s mother has been advocating for her son since she voluntarily took him to the LCSO after he came home and told her that he felt like he was under police surveillance (DeShon’s mother would later learn hours after the bodies were found, LCSO Det. obtained a court order to have DeShon’s cell phone GPS tracked via his cell phone carrier—when Det. located him as he was a backseat passenger in a car w/friends, among other things—Det. took photos of his shoes—in the end he was free to go. If Det. had made contact with DeShon’s mother—they could’ve saved taxpayers money, judge’s time, etc.). The 2nd lead det. Don Odham was fired; $30k paid to criminal defense attorney Greg Cummings who never so much as filed a defense witness list; about 4 court-appointed attorney; 6 days ago a new judge was assigned to DeShon’s case—trial date set for October 14, 2013. All in all, DeShon has been charged with cultivation of marijuana, possession of drug paraphernalia, two counts of 1st Degree Murder, and solicitation to commit 1st Degree Murder—he has pled not guilty. DeShon is Innocent! In the cultivation of marijuana, possession of drug paraphernalia and two counts of 1st Degree Murder—there are no sworn witness statements, there is no physical evidence, no material evidence, and no circumstantial linking him to the crimes. Nothing! The evidence that can exonerate DeShon is being kept under Sealed court order, his cell phone records were immediately Sealed by the State Attorney’s Office. Also, the victims’ autopsy reports have not been made public record—the State Attorney’s Office will not allow the Medical Examiner’s Office to release any information about the victims. DeShon & his mother want to know the victims’ time of death. The solicitation to commit murder was an inside the jail plan, with Det. saying that DeShon solicited a “Hit man.” DeShon had been in jail for over a year & half when this charge came about. DeShon had no money to pay a hit man—let alone know the whereabouts of the person (witness) to whom Det. say DeShon ordered the hit on. DeShon pled not guilty to the charge. As punishment for his mother firing his private attorney (solicitation so they say), DeShon has been in solitary confinement for nearly 10 months where he is unable to call home and he cannot have visitors. All of DeShon & his mother’s special request for visitation have been ignored. Although DeShon & Laqecia had ended their relationship, they remained friends. There was no animosity between them. When Laqecia & her brother, Sterling were found murdered, Laqecia & DeShon had been broken up for about 3 months. Laqecia had gotten back with her on again off again boyfriend, who he told Det. that Laqecia told him that he was the father of her unborn baby. Laqecia’s family members did not name DeShon as a suspect– so why did detectives focus all of their attention on DeShon? DeShon did not have a history of violence—so what is the problem? This question remains today. Whenever a black male child is involved with law enforcement and the family hollers “Foul”—people on the outside always asks—why? Why—would experienced law enforcement agents lie? Why would they want to falsely accuse a child—set them up? This question is being asked in Valdosta, GA in the investigation of a 17-year-old black male child by the name of Kendrick Johnson. The community is asking, why would the sheriff’s office and the GBI cover up what happened to Kendrick Johnson? What is the problem? A question being asked by the community to news media outlets about another 17-year-old black male child by the name of Trayvon Martin is– why are they (the media) using old pictures of Trayvon Martin? Why are they trying to portray Trayvon as a much younger child? Why are they not showing more recent pictures? What is the problem? The problem is—law enforcement officers LIE and the State Attorney’s Office will support their local LEO. That’s the problem. In the Kendrick Johnson case, the FBI has come in to investigate. In Trayvon Martin’s case, a special prosecutor (outsider) had to come in to prosecute the case. In an attempt to promote their lies, State Attorney Willie Meggs and Chief State Attorney Georgia Cappleman ignored FBI and FDLE lab reports. Assistant State Attorney Eric Trombley input his lies to have DeShon charged as an adult in the cultivation of marijuana charges. LCSO continue to LIE. On the Leon County Sheriff’s Office website, they have DeShon Thomas’ mug shot from when he was 17-years-old; they have his age listed as 20 years-old. DeShon is 19-years-old. DeShon has since cut his hair and goatee—in which he now actually looks younger than 19-years-old. 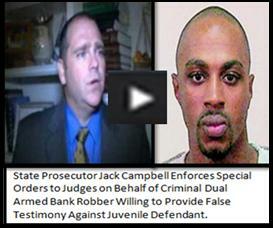 However, Sheriff Larry Campbell & his son, State Prosecutor Jack Campbell are desperate. Deception seems to be in their blood. DeShon & his mother continue to pray for fair and equal justice.